Karen Moeller and Tony Trout's podcast of unending excellence and joy. Subscribe via iTunes, or click the links at the bottom of each episode to listen and enjoy. You can also listen to our show on Stitcher Radio. You can also hear it on their free iPhone/iPad/Android app. The Realm of Possibility #52: Case Dismissed! Karen and Tony discuss Karen's powers of observation, the weakness of our characters regarding disability and how easy people think Karen's jobs are. Karen and Tony discuss our decent into Waterword, Laser Buses and doing things you shouldn't on their 50th episode! Those Fifty, Nifty United States! Karen and Tony discuss the ethical dilemmas around animating oral care. Karen and Tony discuss the cars that old people buy. Plymouth brand was created by Chrysler as a low-cost disruptor. Plymouth was discontinued in 2001. Karen and Tony discuss the difficulties of selecting and eating free food in public. Karen and Tony discuss the desert, the persistence of rocks and the most satisfying size for mountains. The Rocky Mountains at Denver are called the Front Range. It's pretty dramatic. Salvation Mountain is near Niland, California. It's probably America's largest folk art "installation". 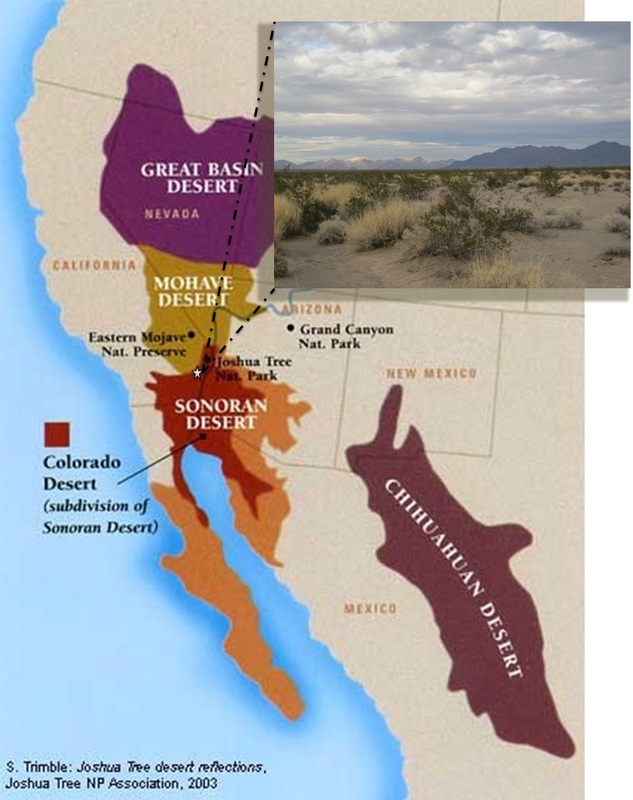 The desert around the Salton Sea is part of the Sonoran Desert, which includes parts of Mexico and Arizona. Karen and Tony dispense with pleasantries, then discuss imperfect invitations and the exuberance of children. Karen and Tony discuss night terrors and the pitfalls of asking of "How are you?". Karen and Tony discuss how old songs stay alive, sympathize with old people who lack silverware and touch briefly on Tony's seeming lack of empathy. Karen's memory is right on: the Fly Robin Fly medley on Donnie and Marie was bizarre. Donnie and Marie generally stuck to contemporary covers, but they did take the occasional stroll down memory lane. Here is a site dedicated to the Osmonds. The web has everything. Irving Berlin died in 1989 at 101. Karen and Tony discuss classiness and New Year's resolutions. Karen and Tony discuss fasting, medical ethics and touch briefly on the lottery. Karen's bought two tickets to the December 17th, 2013 Mega Millions. Karen and Tony discuss Strawberry Newtons, raking leaves and how dirty dirt is. The world is not covered in a light dusting of urine. Dust is mostly just dirt, much of it from outside. Booing can be very complicated. Karen and Tony discuss what neural implants could do for Facebook. Karen and Tony discuss Count Chocula, Frankenberry, Boo Berry and Frute Brute. And mushrooms. Here's a visual comparison of the old Monster Cereal boxes and the new designs. 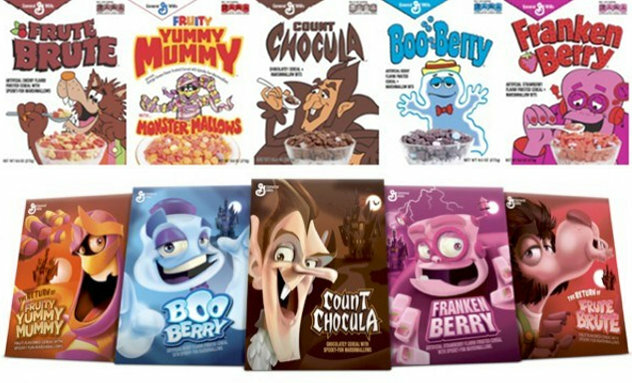 Here's a nice history of the Monster Cereals with verification that Boo Berry came out later. Karen does her impersonation of kids these days. Here are some recipes for those giant puff ball mushrooms. Karen and Tony discuss their trip to Door County, Katherine Hepburn's clothes and Karen's blossoming public assertiveness. Peninsula Players is right on the water and has been performing since the mid-30s. There is hope for people with Candy Crush addiction. The Farm just north of Sturgeon Bay on Highway 57 is a great place to meet farm animals and feed the goat's milk to real kids. The Farm was just as large as Karen remembered. The Katherine Hepburn exhibit at the Trout Museum was wonderful. Here is a wonderful sketchbook from someone else's visit to the Katherine Hepburn fashion exhibit. Here's a picture of the gown she wore in Adam's Rib. Karen and Tony discuss the original, "lost" Episode 34 and what professional atheletes should do during a rain delay. We may be able to recover the lost Episode #34. Matt Kenseth WON the first race of The Chase. The Superstars TV show from the 70's has its own website. The Texas Rangers may never win the World Series, but they know how to have a good time. The minimum salary for the 2013 season is $490,000. The average is $3.2 million. Karen and Tony discuss invading vs. observing aliens and their choice of cellphones or shoes. You cannot see fish with thermal imaging. Some aliens are kind and some are hostile. According to this guy. Very nice 90's era animated gif. Aliens are not likely to have the same values as we have. Extremely nerdy theory that Earth-like planets are rare. Karen and Tony talk about unpowered human flight and the appropriateness of looking at people in other cars. The Realm of Possibility #31: P'KOWWW! vs. P'SHEWWW!! Karen, Tony and Butter narrowly avoid a tragedy in the woods. Karen is right. We hiked in Rocky Run Oak Savanna State Natural Area. Not a Park or a Forest. It's always opossum, skunk, weasel and snowshoe hare season in Wisconsin. Find out when you can kill certain animals. Here's the webpage for accidental shootings. We weren't able to find any statistics on people being accidentally shot in the woods, nor even guidance about whether you should belly-crawl out of danger. We could not find a story about a hiker being shot in Wisconsin. This does not mean it hasn't happened.